My 1818 doesn't playback any sound coming from the web through Chrome DESPITE the fact that I went into Win10 System and verified that it IS working through Win10, so what's the problem? I ALWAYS have problems with this unit simply trying to use it like you would a normal sound card but it never works. I can't stream from my phone either. Assuming that you're using the ASIO driver, be aware that it is not multi-client capable. If you have Studio One loaded, your 1818 will not be available to any other application. That's why I've been forced to stick with my motherboard Realtek audio device for Win10 and system sounds, and use the ASIO driver only for SO/Notion/standalone VIs. If there's a YouTube video I want/need to listen to in best quality, I make an ASIO output pair the system audio device, listen to the YT video, and then set the Realtek device back to the system device. Thanks Martian. 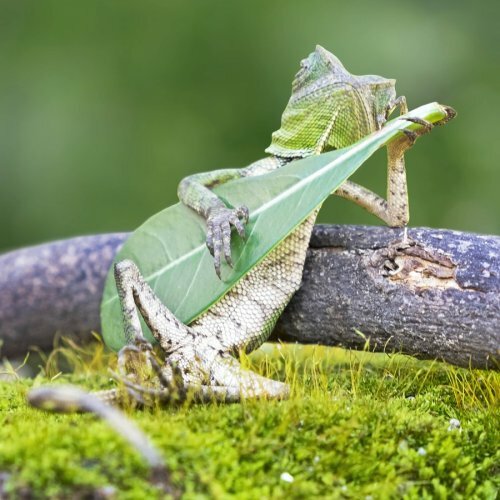 I think I follow you. And you may have answered I'm just not seeing it, but how do you send that Realtek signal to your nice monitors as opposed to the video monitor spkrs? Ah, I don't sent the Realtek audio anywhere other than the Bose speakers they're plugged into. I route the audio via Windows to the 44VSL/studio monitors. Right-click on the speaker icon in the lower-right hand corner in the taskbar. Select "Sounds". Select the "Playback" tab. 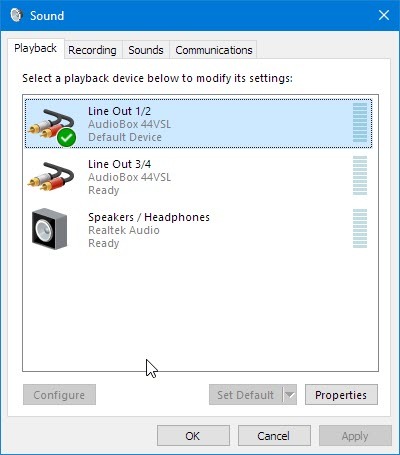 Click on the ASIO audio pair tied to your monitors, then click on "Set Default". 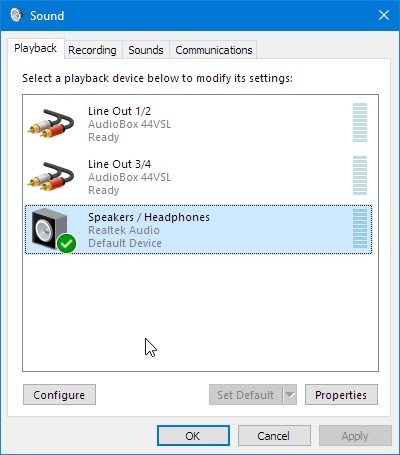 When finished listening, click on your Realtek device and "Set Default". Note that I have both the Realtek and AudioBox devices configured for 44.1 KHZ/24-bit, although that shouldn't matter.